I am really loving Navy and Yellow right now. 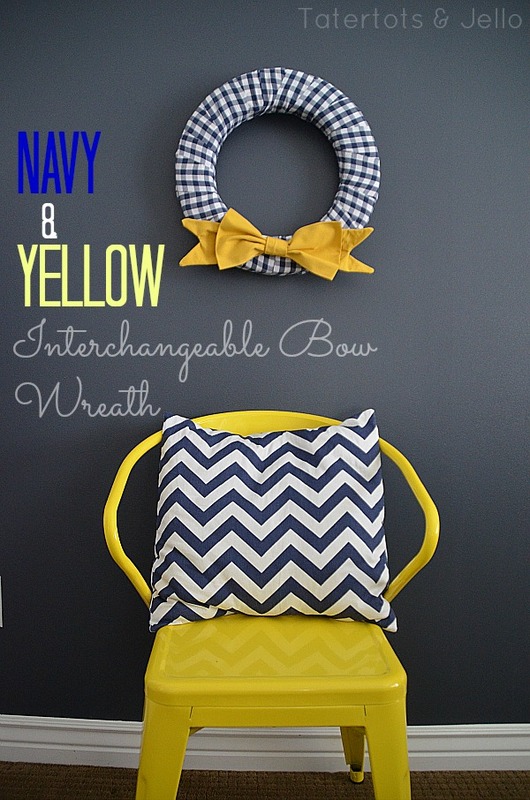 I recently changed out my little kitchen nook for Spring with Navy and Yellow. And I made a bunch of pillow covers for my home. 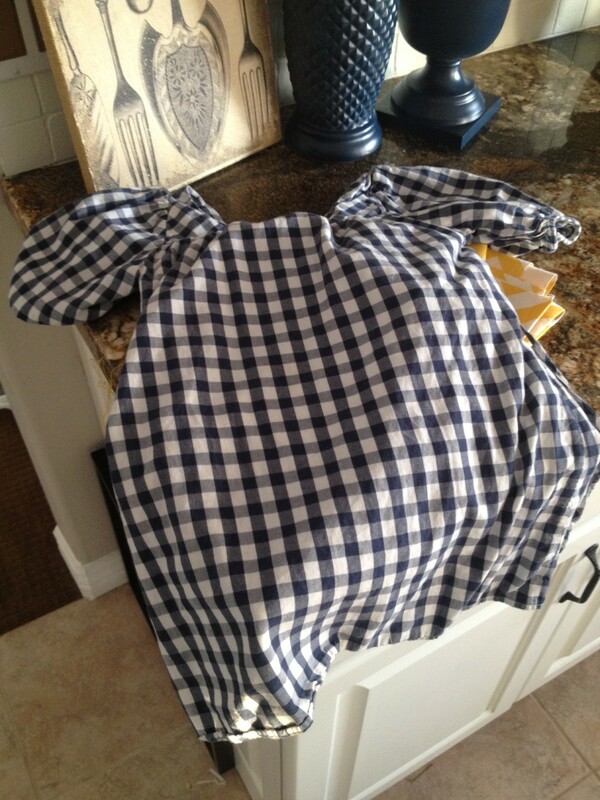 I was going through Ella’s clothes she has outgrown the other day and I came upon a navy and white checked shirt. It was one of my very favorite shirts that she wore. I thought it would be fun to take the shirt and make it into a wreath. So I did. I took the shirt and cut 3-inch strips in the material. Then I wrapped them around a syrofoam wreath form. Since the strips were pretty short, I started and ended each of the strips at the back of the wreath, hot glueing them down at the back of the wreath. One I finished wrapping the wreath in shirt fabric, I made some colorful bows to go on the front. I thought it would be fun to make a wreath that could have different bows. 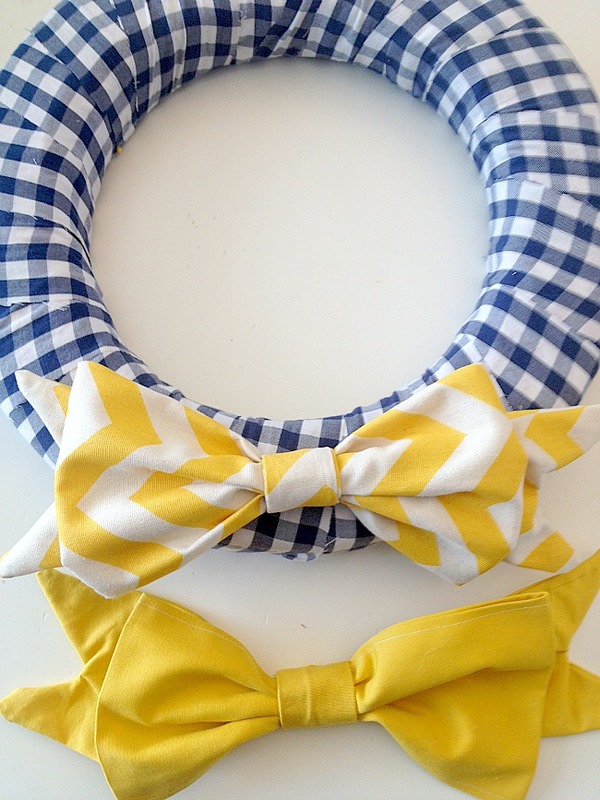 Kind of an interchangeable wreath that could be changed up for different occasions or seasons. So I made the bows. There are three different components in the bows. The first is the back part of the bow. I took two pieces of material and cut out a long strip with the ends with two points. I sewed those pieces together and left an opening at the center, so I could flip the material through. The center of the back will be covered up by the front part of the bow. The second part was the front part of the bow – which is basically a big rectangle. I folded the rectangle together until the sides touched each other, with the right sides facing inwards. Then I sewed the edges together at the top and bottom. Then I flipped the inside out so the right sides faced outwards. Then I sewed a 4 inch tube of material for the center of the bow. Once that was done, I wrapped the center of the bow around the large rectangle and the outer edges of the bow, making a bow shape. And then I hand-stitched the back of the bow to the center to keep the bow shape in place. I made a couple of different bows. ANd I attached them to the wreath with pins. So all I have to do to change it up is unpin the bow and add a different one. I thought this would be cute if I made a RED bow for the 4th of July. Red White and Blue! I love the PRETTY Spring look of this wreath. So fun!! I also made some matching pillows and put them on a little bench. So pretty, nautical and SPRING looking!! Have you made any SPRING projects? We would love to see YOUR Spring ideas!! I love blue and yellow also, October ? Is it to early to think spring? This is so cute, how did I not see this earlier? 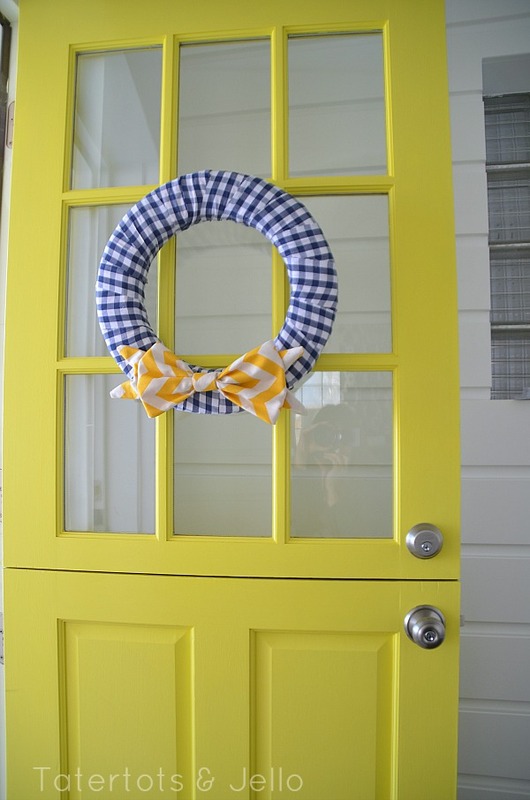 I love the blue and yellow combo, especially on the yellow door. Hello, spring! Thanks for the blast of sunshine, Jen. New follower, found you through Pinterest. Thank you! Your wreath is so cute! 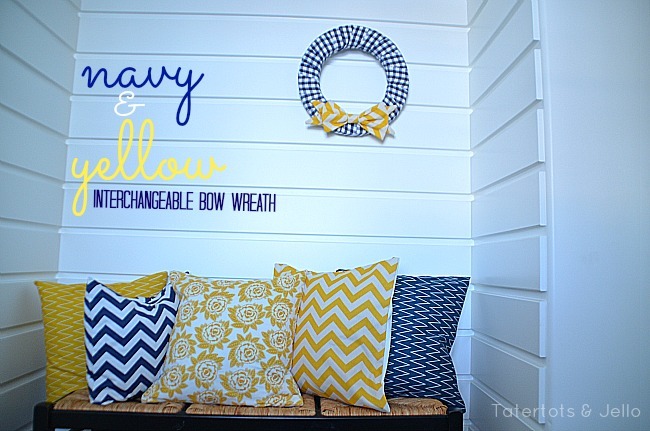 Love the colors navy & yellow together too!! The wreath is so fun and pretty!! Love it!! Thanks for sharing some springtime inspiration!! Sooo Cute & “springie”!! Gives me ideas to make one too! Sorry for all the snow it looks cold, but pretty. this is adorable, Jen! 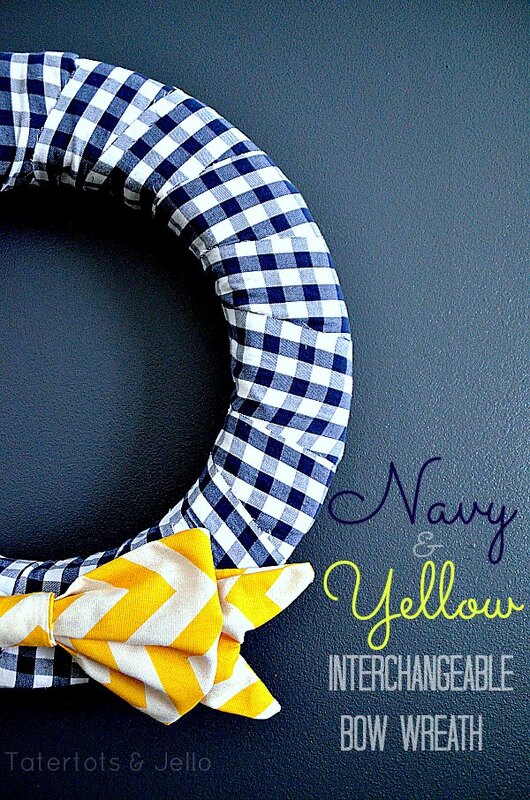 i am loving your navy & yellow posts! I am really loving all the navy and yellow you are sharing! It is so cute! Great ideas Jen! Thanks Cindy!! I am trying to use color to keep me out of Winter funk. haha! I hope things are going well for you. Miss you!! Jen, I love your wreath! It’s darling! This makes me so excited for Spring! Thanks Kami Kam!! Miss you my friend!! 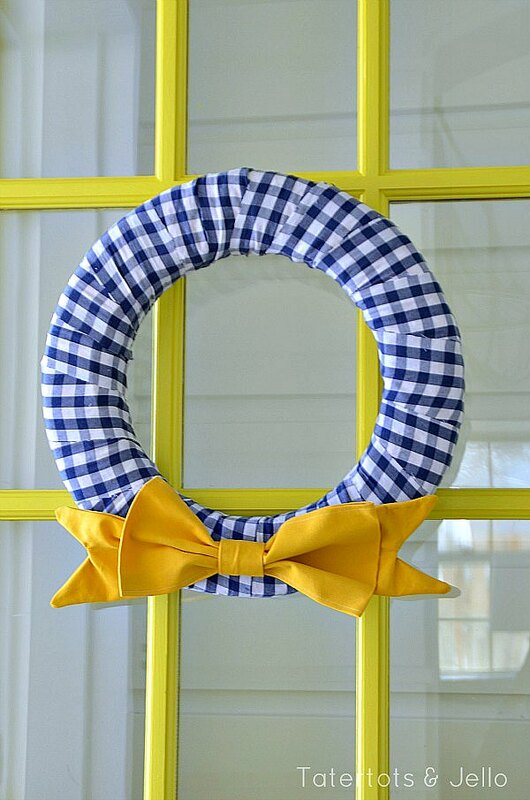 Super cute wreath! 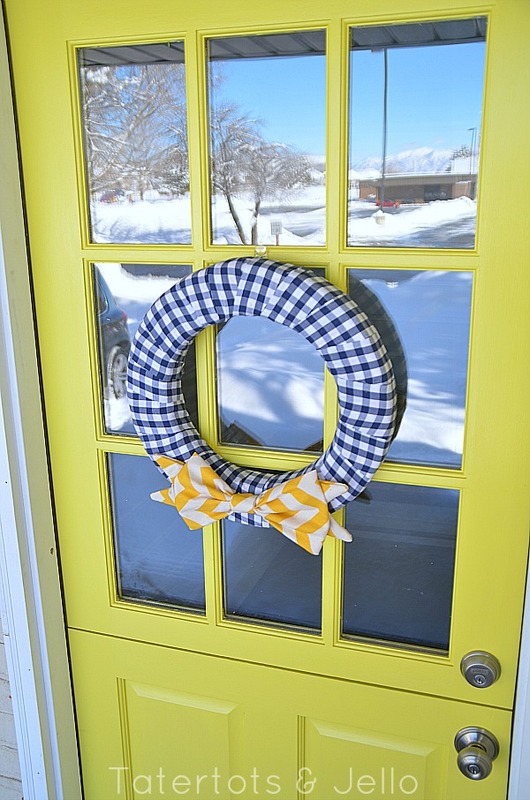 I love the navy and yellow combo, too…so cheerful. 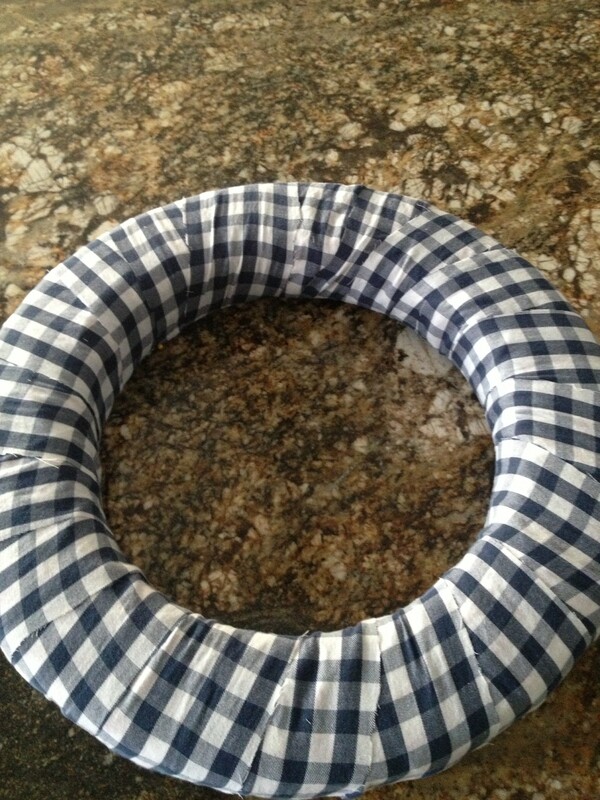 I’m inspired by the fact that you used one of your daughter’s outgrown tops for the wreath check fabric…such a great idea to reuse fabric that has an emotion tied to it. And LOVE all of your fabric choices for your pillows! I’m digging the fabric trend of 2 color, bold geometrics that is going on right now. Classic AND fun! XXXOOO! Thanks Amy!! I love seeing my wreath and thinking about Ella in her little blue and white top. I love colorful geometric fabric too – so happy and eye catching!! I will be right over Cheryl!! I really wish I could – that would be so fun!! I am super excited to see your new couch in your home. It’s beautiful!! Love those colors together! 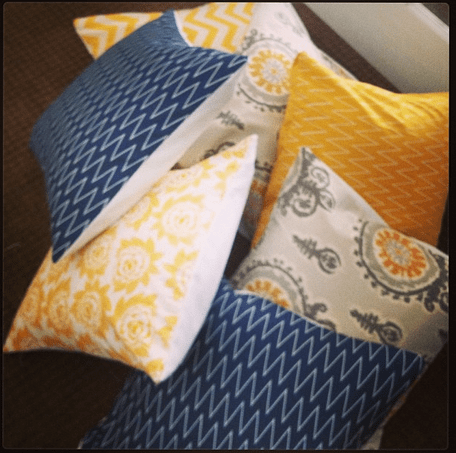 Where do you find your fabric for your pillows? I got the grey and yellow Ikat and the big yellow chevron material at Hobby Lobby. 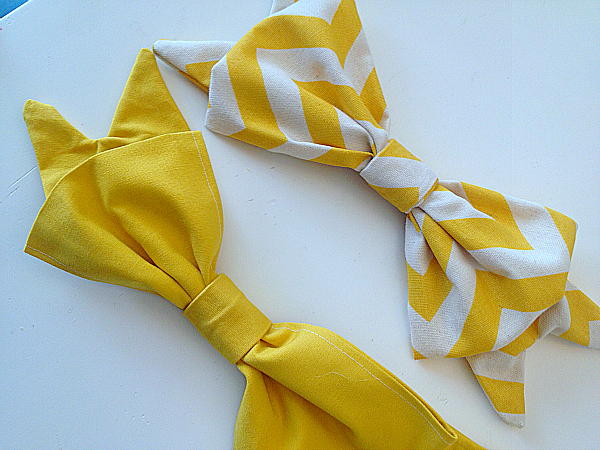 And the blue chevron and yellow chevron and yellow and white print from Riley Blake. Wow!! your design is so pretty!! I love that you make patterns out of paper that look like quilts. That is so cool!! Oh my goodness – how awesome!! I bet you will do something amazing with your grandma’s fabric. That is so cool!! Thanks for the sweet comment Bridgett!! Jen, this is thee most ADORABLE wreath ever. It is Simple yet makes such a statement. I love the sentiment that it also has. 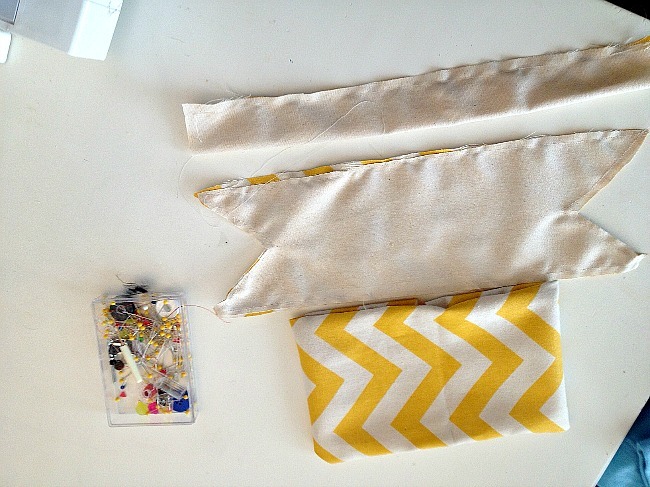 I just posted today a “My first Apron” for the baby out of one of my old maternity shirts. You should stop by and see it.. It’s very Springish 🙂 You know this would make a Sweet Wedding Gift for Ella ( when she older and gets married 🙂 with a picture of her in the dress when she was little. How sweet would that be. Now you just need to make a RED bow and it would be Perfect for the 4th of July 🙂 Also you know I will be EYEBALLING my children’s clothes with the thought of making a WREATH!! What a fabulous idea – I can’t wait to see it!! I love that Angelina. You are so so talented. Thanks for stopping by my friend!! Thanks Marty!! I hope you are having a great day!! I love, love, LOVE it! We just went through Littlest’s shorts today – oh dear, he can’t wear 4T anymore 🙁 – and I snagged a pair of blue pinstripe shorts and set them aside and “The Husband” just gave me a look like “oh I know those will end up as napkins or a wreath, etc.” LOL And yes. They probably will. I also love the reflection of snow in the glass in your pic. We’re in FL so it’s Spring fever around here with temps already in the mis 80s but we don’t get any views like that! Hi Claire!! haha – I love that your husband knows you so well!! It’s so fun to take something that means something and remake it into something else that means even more because of what it used to be!! Thanks for the comment. I really appreciate it! !